I had several requests for my calzone recipe so I added it to my last post. But then I wondered if anyone actually went back and read it, so I’m posting it again—with pictures! I make a few changes to it, though. 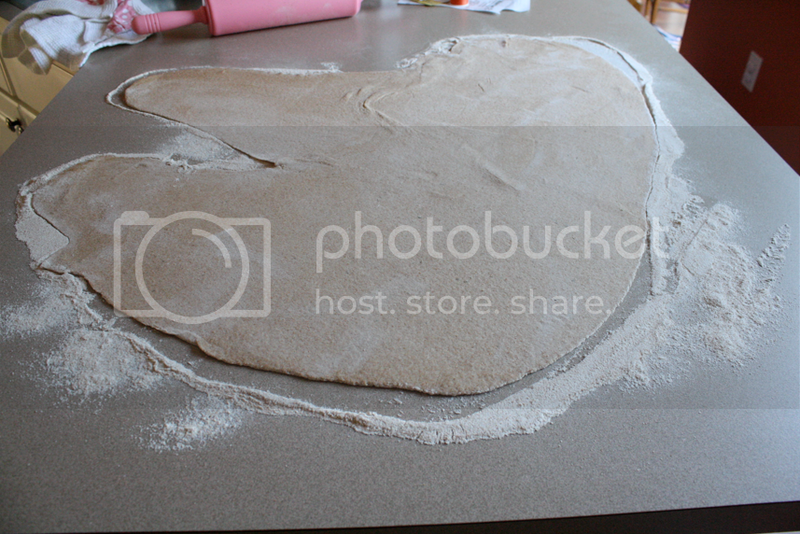 I only use wheat flour. I don’t even know how much because I don’t measure. I just dump flour in a little at a time until it reaches the right consistency. 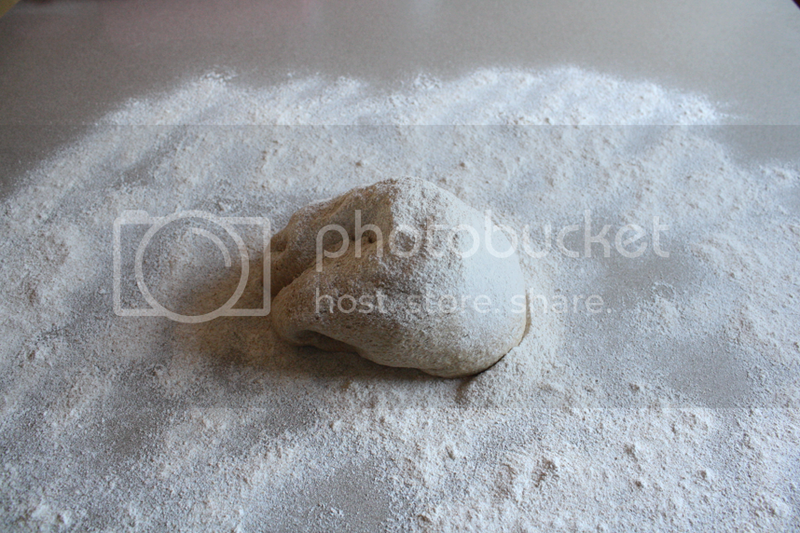 I also add garlic powder and Italian seasonings to my dough. No measurements, I just eyeball it. Once it’s raised and ready to go, I roll it out on the counter as big as I can get it. 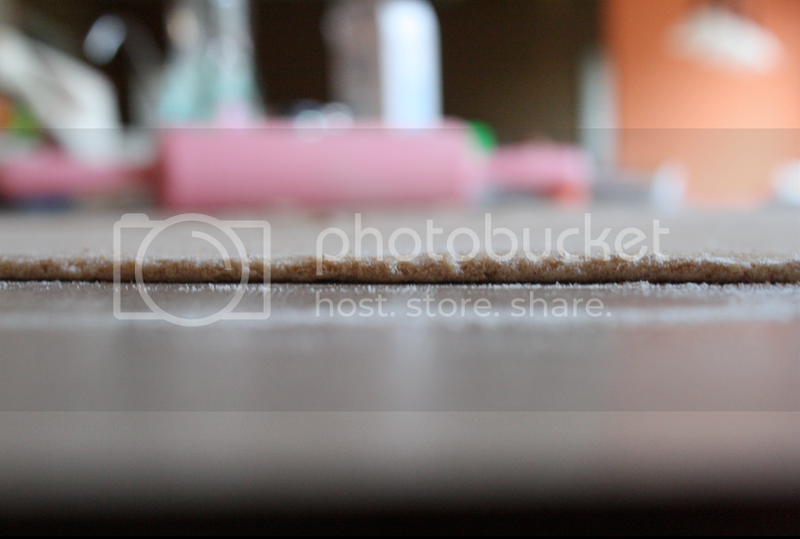 I don’t use cutting boards or cookie sheets, I roll it directly on a clean counter. 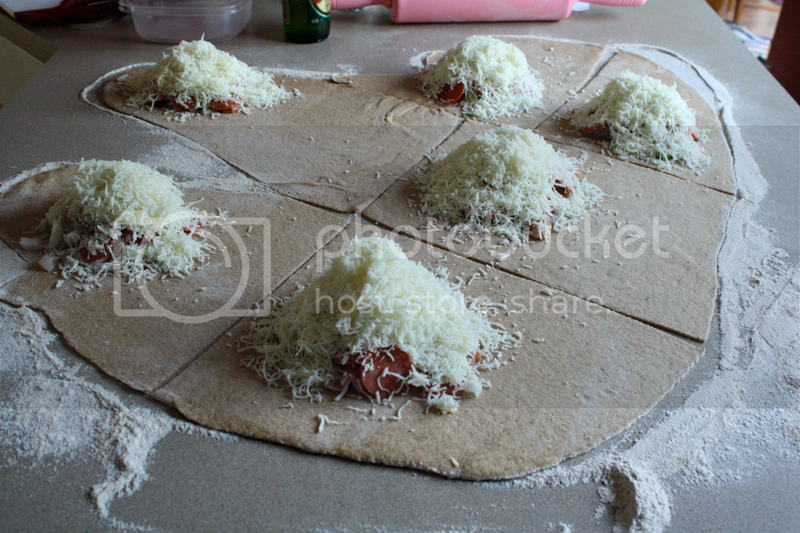 You then want to cut your dough into pieces. How many you cut and how you do it is completely dependent on your personal preference. 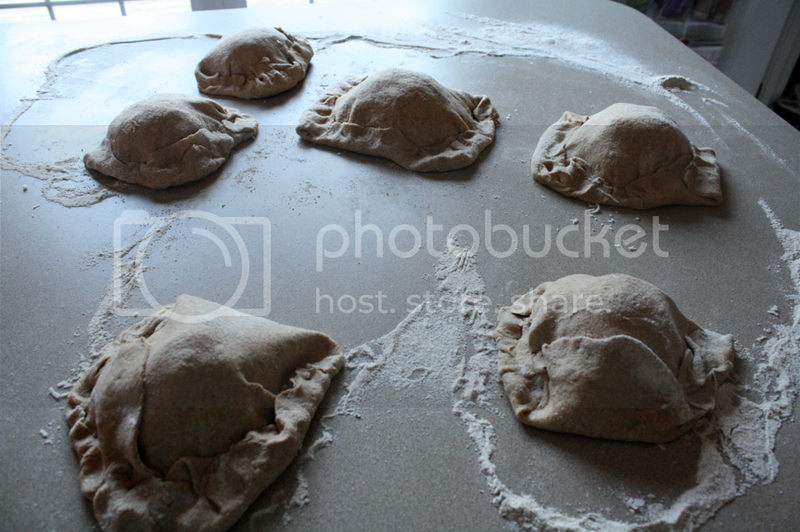 I generally make about 6 calzones from this recipe. When you cut them you want a rectangular shape. I usually do about twice as long as they are wide. As for what you put in it–that’s totally a personal preference. My Mom used to make them specific for each of us. I generally make all of ours the same. I use pepperoni, ham, and mozzarella cheese. At times I use up whatever veggies we have in the fridge and usually always add onion and bell pepper. But you can put olives, mushrooms, basically whatever you like to eat on your pizza. 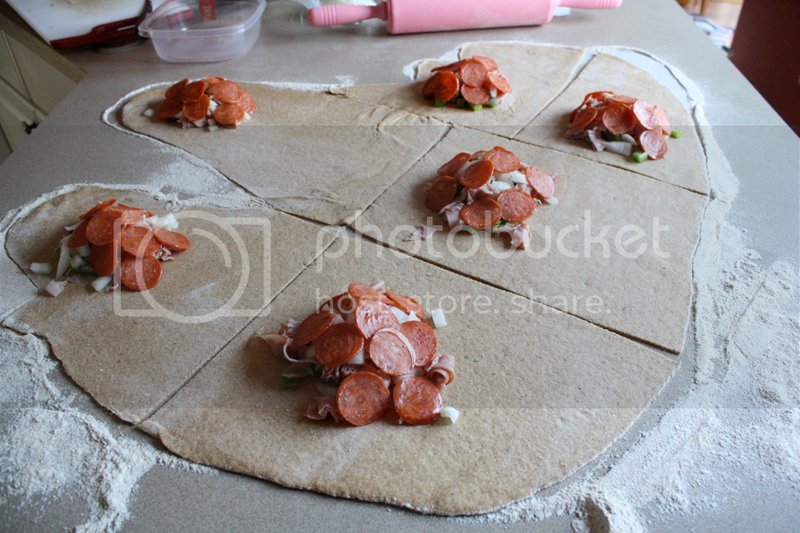 Pile all your toppings on each other at one end of the dough piece. These have bell pepper, ham, onion, and pepperoni. I pile on the cheese last, but the amount you use is a personal preference. This is a handful per calzone. Take the far end and stretch it over your toppings. 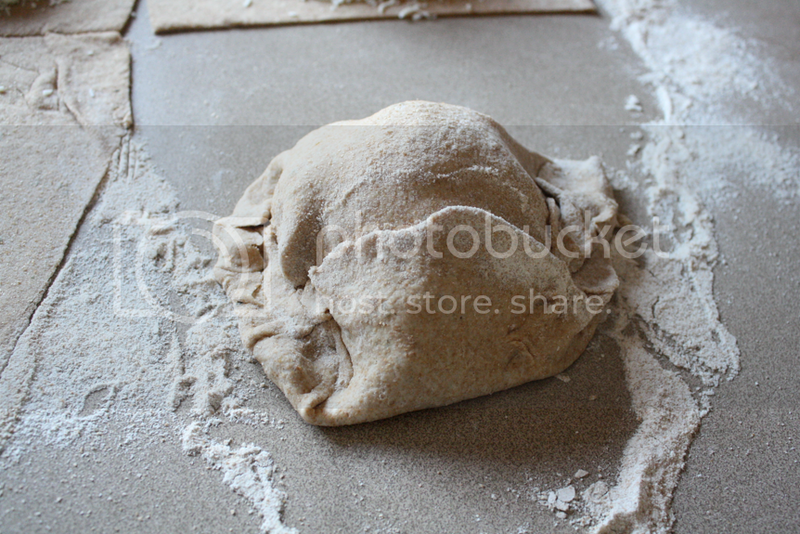 Then take the front end and fold it up, folding up the sides to seal it all in the dough. Transfer the calzones to a greased cookie sheet, or one lined with parchment paper if you’re lazy like me, and bake according to the dough instructions (generally 400 degrees for 15-20 minutes) or until they’re golden brown. While they’re baking, make the sauce. You can use regular jarred marinara if you want, but I never buy pre-made sauce. It’s much cheaper to make it yourself and takes just a second to make. In a sauce pan, combine tomato sauce, garlic, Italian seasonings (either the pre-mixed Italian seasonings or your own mix. I use oregano, basil, thyme, and sage. ), a dash of sugar, and crushed red pepper flakes. I’m not a huge fan of the red pepper and it’s too hot for Sofie, so I add it separately to The Hubs calzones. 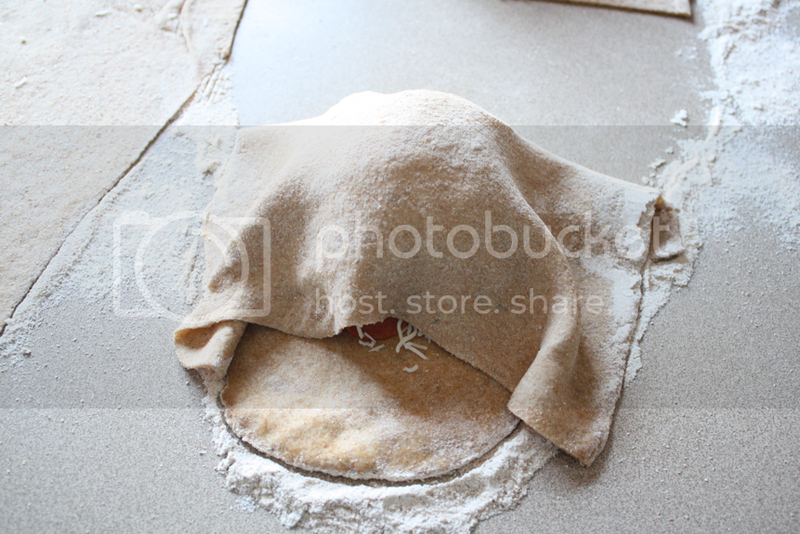 Then just pour it over the top of calzone when it comes out of the oven and enjoy! 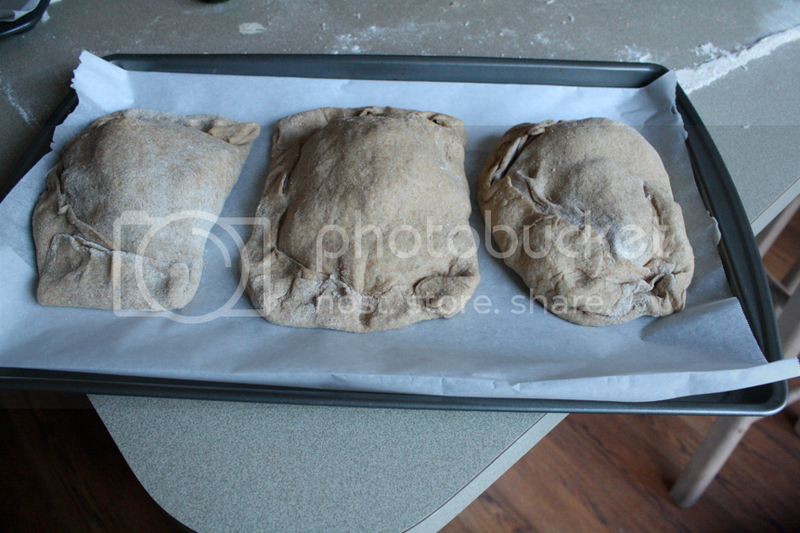 It takes maybe 15-20 minutes to construct your calzones, so it’s a fairly quick and easy meal. I also think it’s a good one for kids to participate in making. As my girls get older I’ll let them build their own before we bake them. To keep them identifiable as they go in the oven, add something special to the top of each person’s. My Dad always had a jalapeno pepper sitting on the top of his. 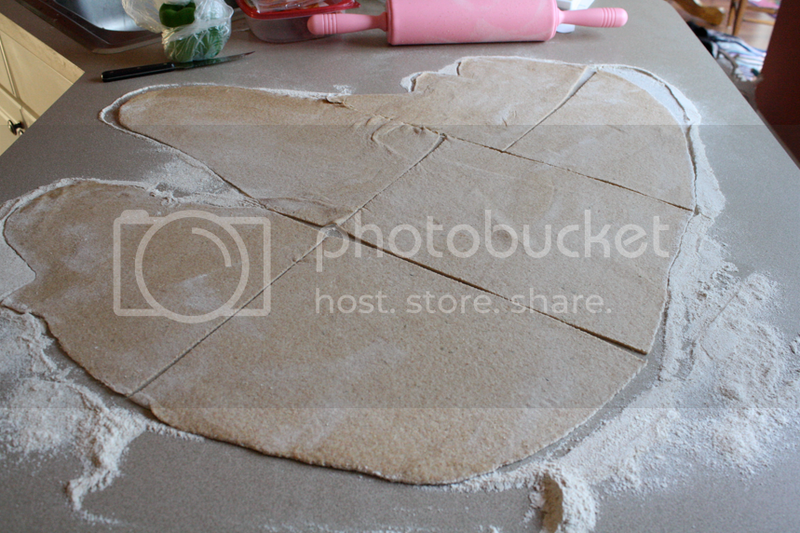 You could also mark the dough with their initial or other shape. Have fun experimenting with your own creations! Oh, awesome! I am so, so excited to try these out! Thank you!